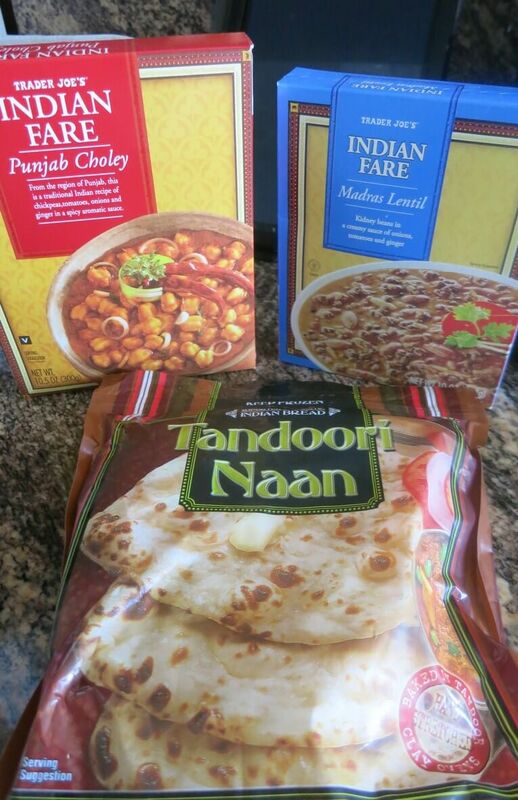 TonightÂ I decided to use three items from my cache – frozen naan, a box of madras lentils and a box of Punjab Choley (a delicious blend of chickpeas, tomatoes and onions). Which means I needed a protein that would go with this Indian feast. 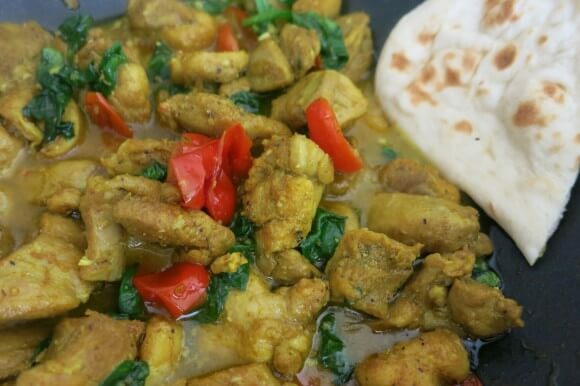 I remembered a chicken dish that I had made a couple months ago – a skillet Sazon chicken that I found on Skinnytaste. Skinnytaste recommends serving with avocado or in fajitas. However, I feel that it has an Indian flavor to it – maybe because I substituted turmeric in the Sazon seasoning blend for the achiote. Or maybe because I added spinach to the chicken dish (okay, I know it’s not this, but I wanted to mention this second change I make). Either way, it was the perfect accompaniment to our Trader Joes delights. Rub Sazon seasoning into chicken pieces, covering thoroughly. Heat 1 tbsp oil in sauce pan. Add chicken, cook thoroughly. Remove chicken from pan, keep warm. Add remaining tbsp of oil to pan, and heat. Add minced garlic, and cook for 1-3 minutes, till browned. Add tomatoes and dash of salt. Cook for approximately five minutes, till tomatoes have softened. Add chicken and broth to pan, cooking till heated through. Add in spinach, cooking till wilted down. Serving suggestions include over rice or with any delicious prepared side dishes from Trader Joes. And of course, naan.